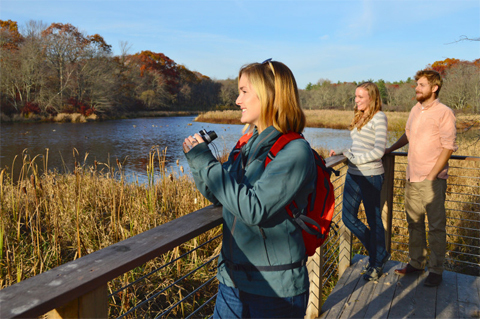 Discover what makes the Acushnet River special at The Sawmill, a popular park in Acushnet. Take a walk on the nature trails—including some that are ADA accessible, go fishing, paddle a canoe upriver, or look for birds and wildlife. Explore inside the Hawes Family Learning Center, where informational exhibits tell the river’s story. Most important, relax and enjoy this natural paradise. The Sawmill was once home to a large, bustling lumber yard owned by the Acushnet Saw Mills Company. In 2014, the Buzzards Bay Coalition restored The Sawmill to protect clean water and create a park where everyone can explore the outdoors. Download a trail map: The Sawmill.